The Superman Fan Podcast: Episode #376 Part II: Superman Comic Book Cover Dated November 1964: Superman #173! Episode #376 Part II: Superman Comic Book Cover Dated November 1964: Superman #173! Download Episode 376 Part II! SUPERMAN 173, November 1963, was published on September 17, 1964. It contained 32 pages for the cover price of 12¢. Mort Weisinger was the editor, and the cover was pencilled by Curt Swan, inked by George Klein and lettered by Ira Schnapp. It featured the issue's third and final story, all of which were eight pages long. - (12:30) THE UNTOUCHABLE CLARK KENT, written by Leo Dorfman, pencilled by Curt Swan and inked by George Klein. - (30:21) TALES OF GREEN KRYPTONITE NO. 1, written by Otto Binder and drawn by Al Plastino. 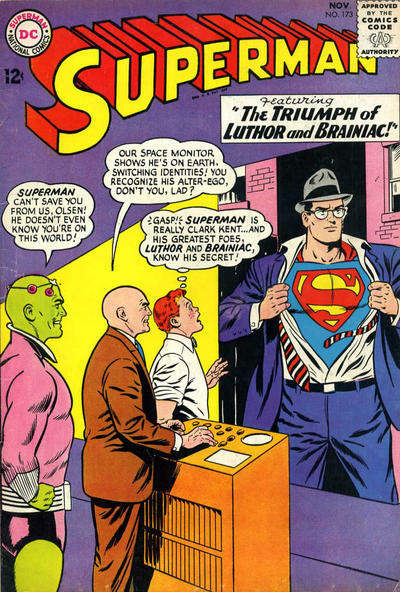 - (43:14) THE TRIUMPH OF LUTHOR AND BRAINIAC, written by Jerry Siegel and drawn by John Forte. This was the 49th Siegel silver age Superman story, and the 126th overall for the era. The episode begins with the MY PULL LIST segment, where I review the March 2018 cover dated comic books I ordered from Discount Comic Book Service. Next Episodes: SUPERMAN COMIC BOOKS COVER DATED NOVEMBER 1964: PART III: ACTION COMICS 318 & PART IV: SUPERMAN'S GIRL FRIEND LOIS LANE 53! Then we will cover: SUPERMAN FAMILY COMIC BOOKS COVER DATED DECEMBER 1954: PART I: SUPERMAN'S PAL JIMMY OLSEN 81, PART II: WORLD'S FINEST COMICS 146 & PART III: ACTION COMICS 319! Episode #375: Superman 2017: The Year In Review!